Nuclear fusion is the process by which lighter elements are fused together to produce heavier ones. It's the primary source of energy for every main sequence star in the galaxy. Artificial fusion is also possible, the most vivid demonstration being the explosion of a thermonuclear weapon. In many stars, and the Sun in particular, fusion of hydrogen (H) to produce helium (He) is the most common kind of reaction. In the Sun the most common reaction pathway is the proton-proton chain . 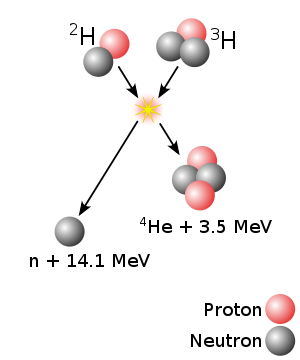 First 2 protons collide to produce the deuterium nucleus; in the process one of them turns into a neutron and a positron is released. Then another proton crashes into this nucleus to produce a 3He isotope. Finally 2 3He isotopes collide to produce a helium-4 nucleus. This reaction produces a tremendous amount of energy, but is very slow to occur; on average, it takes a billion years to complete. Only one such fusion reaction occurs in every cubic kilometer of the sun's core per second. In heavier main sequence stars (e.g. Sirius A), this hydrogen fusion reaction is catalyzed by carbon, in what's called the CNO Cycle. The net result is the same as from the proton-proton chain, but the reaction happens much more quickly (thousands or millions of years average reaction time, instead of billions). As such a convenient source of energy, a fusion reactor that actually produces more energy than it consumes would be of incredible importance. The most studied reaction for this purpose is the fusion of deuterium (hydrogen-2) and tritium (hydrogen-3), which involves two isotopes of hydrogen, one of which is rare, and the other of which is so rare that it has to be synthesized in a nuclear fission reactor. (This reaction has a much higher cross section than the proton-proton reaction found in main sequence stars, and still gives quite a big bang per particle. It has the disadvantage that a neutron is produced, which can cause radioactive contamination. Furthermore, this neutron carries away the lion's share of the energy released by the reaction, and harnessing the energy of a neutron is much trickier than harnessing the energy of a charged particle. Unsurprisingly, this line of research has attracted many cranks as well as respectable scientists. Because it releases the most potential energy, and because of it's relatively high cross-section, it's almost certain that any future fusion reactor will rely on the D-T reaction. Unfortunately even such a simple reaction will be enormously expensive, even if it is possible. As tritium is extremely scarce, with only ~20 kg (~44 lb) on the entire planet, most in thermonuclear weapons, fusion power would be far more viable if the fusion of deuterium and helium-3 were used instead. Deuterium could be acquired by splitting heavy water into its components, two deuterium and one oxygen, and helium-3 could be acquired in the near future via lunar mining. So in conclusion, yes, fusion energy production is possible, and would be the best energy source in human history due to cleanliness and a virtually infinite and uninterrupted supply. There are two main fusion reactor technologies pursued currently: inertial confinement and magnetic confinement. Inertial confinement involves heating and pressurizing a small piece of fusion fuel enough to cause a fusion reaction. The idea is to implode many pellets per second to obtain energy (estimated 20 pellets per second). This is currently done using lasers. The best result yet obtained by ICF is less than 1% of input energy. The major problems with ICF include laser inefficiency (current lasers are extremely inefficient in that they can only deliver about 1% or less of the electrical energy used to power them into IR or Xray energy in the beams that are used to heat the target) and the cost of the pellet. Some research is being done to make more efficient lasers (10-20% efficiency) and the HiPER device was proposed to reduce the amount of energy needed to cause fusion. Even if somehow breakeven is achieved, it remains to be seen how an ICF reactor can implode 20 pellets per second. Fusion reactors are (better said, will be) much safer than fission ones, as unlike fission reactors there's no self-sustained reaction; once temperature and/or density go below critical (very easy) it will simply fizzle out. Also except tritium (that is less nasty than waste of fission reactors, as its half-life is just a dozen years and its radiation cannot penetrate skin (eating or inhaling it is a far more different history), the two other isotopes of hydrogen -deuterium and plain simple hydrogen- are not radioactive at all, as is also the product of its fusion -helium-. The fringe idea most commonly associated with fusion is cold fusion, the claim that self-sustaining nuclear fusion is possible at temperatures far below what should be considered possible. Despite a few hoaxes suggesting the contrary, at present nuclear fusion is understood to require immense pressures and temperatures in order to occur. ↑ For example, to fuse helium a temperature of 108K and a considerably higher plasma density (two hundred times the one in the CNO chain) are required, and both to obtain just a 25% of the energy provided by standard hydrogen fusion. Go further, and not only you'll need far higher both temperatures and densities but also your reactor will basically become a neutrino factory. ↑ See the Wikipedia article on Triple-alpha process. ↑ See the Wikipedia article on Carbon-burning process. This page was last modified on 17 August 2018, at 12:34.